What does this report really mean? How is fatness measured, and what is it? You might be surprised that fatness (or weight alone) is not independently related to your health. 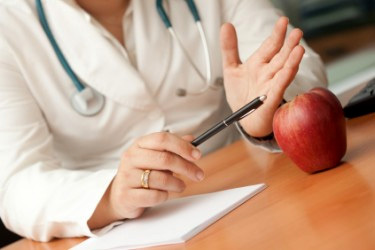 Eat an apple a day for weight loss success! When you calculate your BMI (Body Mass Index) or use a body mass index calculator, you will end up with a number that many medical experts and governmental officials will use as a determinant of your health risks. You will be classified as underweight, normal weight, overweight, or obese. These classifications and the BMI calculator itself has a history which challenges its usefulness as a measurement of health, even though clinicians throw it out as something that matters. Forward thinking integrative health experts will tell you there is more to the story. For example, BMI was never intended to be a measurement of individual health; it was designed to measure the health of populations. So, when we plug individuals’ height and weight into a calculator to come up with a number, we measure a “construct” called obesity. BMI does not differentiate between men and women; between different ages; between those who are heavier because they carry a lot of muscle or those who carry more fat; between different ethnic groups. BMI as a diagnostic tool is multi-culturally inappropriate. Despite studies that show older adults (lovingly referred to as “the elderly”) actually benefit from being heavier, BMI is still used with older adults as a measure of health. When we measure the construct of obesity we end up with firm cut offs; you are either over or under the obesity number. Problems with constructs arise anytime we try to “diagnose” with a construct (such as the DSM V- used to diagnose mental illness whose problems are increasingly noted). BMI is NOT a measurement of health, and should NOT be used solely to classify people on the basis of body weight. Beyond sound bites, we can look to science for guidance. Many scientific studies have concluded that being overweight (not obese, overweight) and older is in fact a good combination. A very well done study published in the Journal of the American Geriatric Society discusses the impact of weight on risk of death over a 10 year period in 9,240 Australian men and women. The minimum mortality risk (LOWEST RISK) was found at a BMI of 26.6 (considered “overweight”) and as BMI decreased from there, risk increased, with the risk of death with a BMI at the lower end of the “normal” range being nearly double the risk of those who were “overweight”. These results were consistent even when divided into groups of initially “healthy” versus initially “unhealthy” people and when years one, two and three were subtracted from the study to eliminate those who might have lost weight prior to enrollment into the study due to a chronic illness. 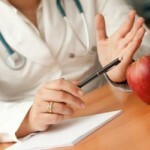 So what has the biggest impact on health, if its not weight? MOVING YOUR BODY. Men who were sedentary were found to have a 28% increased risk of mortality across all weight categories while for women the risk was double! WOW. What if we stopped stigmatizing weight, and just started moving? Think of the incredible population health benefits. My colleague, Arizona State’s Dr Glenn Gaesser, wrote THE BOOK on this – you can read his extensive and excellent book and let me know what you think. So, right now, get up and move. Eat more whole foods, fresh fruits, vegetables, lean protein, plant based proteins, and nuts and seeds. Forget dieting – start living!